The beginning of the 2016-2017 season was rolling around and I quickly realized that I needed new skates badly so I picked up a pair of the Bauer Supreme TotalOne MX3 skates. I didn’t really have the intention of buying any specific pair, I just knew that I wanted to stick with Bauer which is what I have used previously. I also decided that it was finally time for me to get a high-end pair of skates which I previously never had. 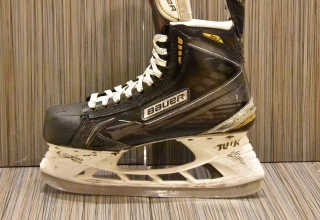 Before the MX3’s, I was in a Bauer Vapour x5.0 skate which was fine and I actually expected to stick with the vapour line. I wanted to be sure so I tried all three of Bauer’s high-end models in each respective line on (Vapour 1X, Supreme MX3 and Nexus 8000) except for the 1s and 1n because the MX3 and 8000 models were a better deal and still a high-end model with the same general fit as the newer versions. I decided I liked the fit of the MX3 the best because the 1X’s were just uncomfortable and too narrow whereas the 8000’s felt almost sloppy and did not wrap my foot very well. The MX3 moderate fit design was a great medium for my foot and they felt comfortable so I went with those. I was really hoping my first pair of high-end skates would be as good as people say they are and that much better from the cheaper, lower end models. I was not disappointed. 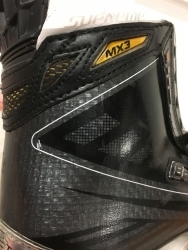 Just like all other high-end and now step-down from high-end Bauer skates, the MX3’s boast a 3D Curv composite boot construction wh ich makes up the quarter-package of the skate (First appeared on the original TotalOne skates). 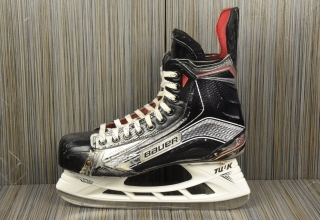 Bauer states that this technology gives a player a strong stiff structure as well as an extremely lightweight boot. They aren’t kidding. The 3D Curv composite in the boot paired with the “ultra lightweight” composite outsole help the skate to weigh in at a mere 820 grams for the size 9.5 model (the size that I have). The Curv technology is also the best in the business for formability when molding the skates by baking them. I could certainly notice a difference in the overall feel and fit after I molded them even when just trying them on. Bauer calls this “AnaformFit technology” which is also helped by the HydraMax liner which still seems to keep its comfortable form over time as well as continuing to wick away moisture along with the Form-Fit + insole. I end up swapping for Superfeet insoles because the Form-fit + I found too flimsy. 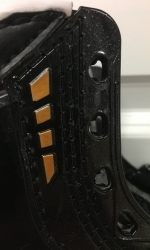 Another feature for comfort found on high-end Bauer skates is what they call Comfort Edge pads which are essentially padding at the top of the skates in the ankle portion. These are strictly found on the top-of-the-line models for Bauer. They don’t affect performance, however they felt great when I was turning sharp on an edge and a definite upgrade from previous rigid designs. 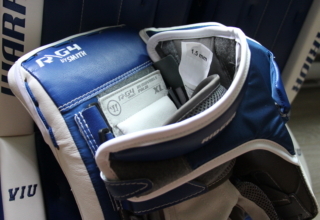 Next, a main thing that the MX3’s have that is now found in all Bauer skates is the TUUK Lightspeed Edge holder. This is a great development because it allows players to quickly swap out steel in seconds with the new trigger system as opposed to the old conventional methods. I have read that this caught on very quickly at the pro level because of how fast they need fresh steel as well as at the recreational level because it saves people the hassle of having to bring their skates into a store and wait for the swap to be made. Now they can just buy the steel and replace it themselves. Even I used the function on these skates. The MX3’s come stock with TUUK Lightspeed Fusion steel which I swapped out for the LS4 steel because the skates needed new blades when I got them and I did so with ease. These features are all found in various skates on the market but I will now go over what differentiates the MX3 skate to most skates on the market. The first thing that stands out for me is the eyelets used on the MX3’s. 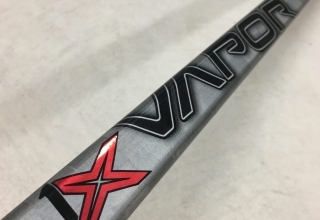 Originally appearing on the APX2 skates, the Injected Stability Lacing System has shown up on every single one of Bauer’s high-end models since. I notice a massive difference from traditional eyelets and I don’t think I will ever go back. 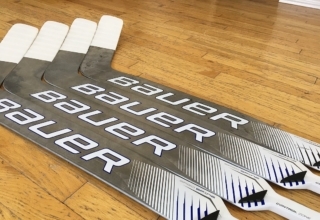 Bauer says that the technology allows for “increased forward flex” which helps with energy transfer. The reason I like it so much is because it wraps my foot better than any other skate I have tried as well as having a lace-lock system incorporated into the eyelets for a tighter feel. 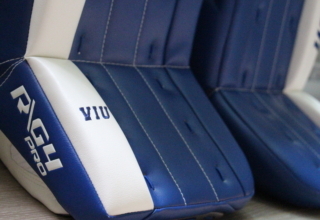 It is just subtler than the one on the CCM 50K’s because it is actually inside each eyelet. I did notice some of the stitching at the very bottom of the lacing system near the toe-box seems to have come out a little which would be bad if it was a big tear because the eyelets are all one piece and almost impossible to repair whereas with conventional eyelets they can be replaced individually. A new feature that was introduced on the MX3’s is the 3-Flex tongue system. Instead of having a stationary piece of composite or other material for the base of there tongue, there is actually an interchangeable piece of Curv composite. This allows the user to choose either “MID”, “STIFF” or “X-STIFF” depending on what they prefer. Each of the options comes in the box and can be changed as many times as desired. 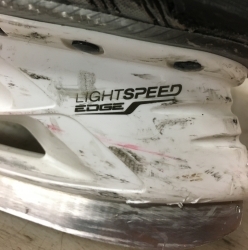 They are kind of a pain to change just because you have to take the laces almost completely out of the skate which is kind of a hassle because of the Injected Stability Lacing System. The tongue on these skates was actually fairly short compared to others which I liked because I put my shin pads over my tongue. I noticed in the 1S’s, they made the tongue a bit longer while still incorporating the 3-Flex system, which they are now calling “C-Flex Technology”. Another new technology that started on the MX3’s is the Free-Flex tendon guard. Unlike other skates, these actually have a flexible tendon guard that allows for a full motion stride and help with explosiveness by springing back into place the second the stride is complete. 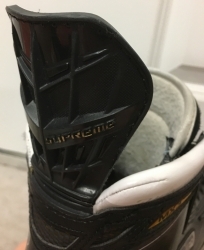 This piece also has the HydraMax liner incorporated into it for maximum comfort unlike the new Supreme 1S model that is just a piece of molded plastic. 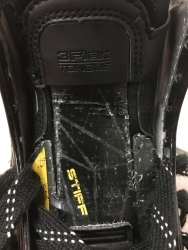 Although the Free-Flex tendon guard on the 1S skates can be adjusted for how much flex is desired (C-Flex Technology), I still think the MX3 tendon guard design is just as good if not better because of the padding for comfort as well as a better shape then the newer version. As Bauer stated, these skates fit anatomically throughout which essentially means they are a consistently fitted feel and size in each part of the boot. There is a medium pocket as well as a moderate heel lock which fits my foot absolutely wonderfully. Granted, the design of the Supreme line is not for everybody and you must insure that you are sized correctly when buying skates. Since this skate was released in 2014 and has been largely replaced by the new skate in the Supreme line (the 1S), not every store still has them in stock. That being said, most stores do still have them in assorted sizes and they can also easily be found online. 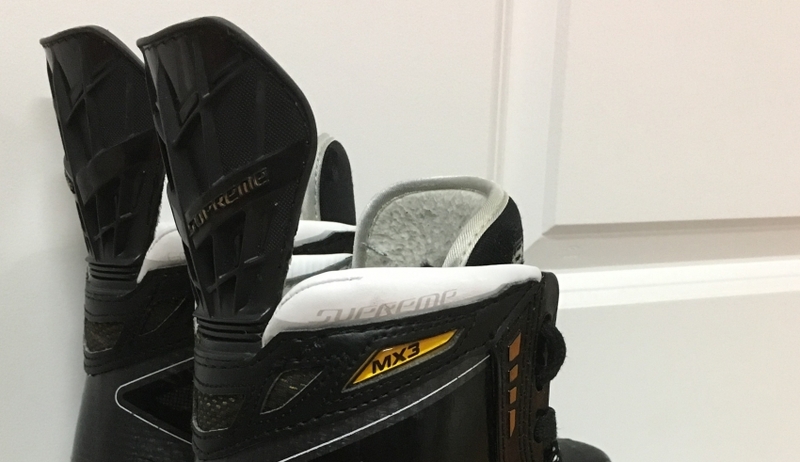 When the Supreme 1S skate came out in 2016, the MX3’s dropped from the original price tag of $899.99 CAD and have been getting cheaper than the $999.99 CAD 1S’s ever since. I believe that these skates are one of the best options when making the jump into the high-end skate market and trying to get used to the new feel of elite level skates. It did not take long to get used to the Curv composite boot and baking just made it easier. The HydraMax liner just made the skate more comfortable than I have ever been used to although I do suggest upgrading to a higher-end insole as opposed to the stock Form-Fit + which I found too flimsy. For someone that is used to a beginner level skate, the 3-flex Tongue system is a great way to ease into the stiffness of the higher-end tongues while still leaving room for change. I never really used the TUUK Lightspeed fusion runners but the LS4’s are outstanding. I can make sharp turns and stops with ease and they also hold their edge longer and are taller than the Fusions were. I thought I was actually going to dislike the Free-Flex Tendon guard but it turned out to be a great feature for mobility. The feature I like the most has to be the Injected Stability Lacing Systems because of how well they wrap my foot as well as how they keep the skates tied tight all game long. Overall, I felt that these improved my skating confidence and ability. Performance: The skates performed better than anything I had ever tried in the past and they continue to do so consistently. 3-Flex Tongue: I use the “STIFF” tongue insert because I like as stiff of a tongue as possible but I actually lost the “X-STIFF” inserts. Weight: My size 9.5’s were 820 grams which is up there with the lightest. Size: I have a pair of 9.5’s but this changes drastically depending on the person. Steel: Like I said, I never used the TUUK Fusion’s and I have heard that they were just average but the LS4 upgrade was definitely worth it. Fit: The Supreme line for Bauer skates seems to work for me with it’s moderate style and medium design throughout. Look: These skates look great with the well chosen graphics and classic black and yellow supreme look. Durability: I have noticed that the Curv composite has gotten a little nick in the boot so I put some silicone caulking to make sure it doesn’t spread but it was not an issue at all, just me taking precautions. I also noticed the fabric at the top of the tongue has ripped but there is still padding underneath and it has not affected anything. Price: Originally, the MX3’s cost $899.99 CAD but since the release of the new 1S, they have gone down to about $549.99 depending on the store or website which I think is very reasonable for a pair of top-of-the-line skates. Recommendations: I would suggest this to someone that has a moderate width and overall size in foot as well as someone that is seeking the explosive “1-2-3” first strides. 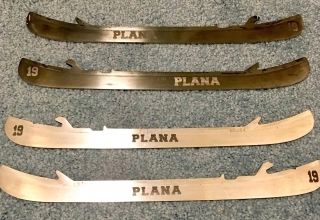 Unlike sticks, not every player should use any skate they desire. If this skate does not feel comfortable on your foot, look at the other options that offer different fits.